158. The Complicated Relationship Between Digital & Psychological Development – How to Shape Human Behavior. 1. What is the connection between sleep and digital media use and how does it impact sleep circadian rhythm? Yet over the past century kids have been losing about 2 minutes of sleep per night per year in the United States. Further, their sleeping patterns are becoming more and more irregular. Sleep depivation in adolescents manifests itself differently than it does in adults in that it paradoxically causes children to be hyperactive and unable to focus their attention – the same symptoms commonly associated with Attention Deficit Hyperactive Disorder (ADHD) and other psychiatric illnesses. If sleep deprivation is incorrectly diagnosed, children are given amphetamines which further prevent them from being able to sleep correctly. Light exposure, notably blue-enriched artificial light actually, confuses the brain, causing it to think it is earlier in the day than it really is, thus suppressing melatonin– the sleep enducing hormone – and delaying your child’s ability to fall asleep by as much as an hour and a half. 2. How is light from digital media different from light from flashlights and television screens? Flashlights use a lower intensity and reflected incandescent light which is a much longer wave length than LED and digital light and thus has much less of a biological effect on humans, whereas the much shorter wavelength light-emitting digital devises are shining light directly into your eyes at a much higher intensity. Televisions are generally farther away from your eyes and so take up a smaller space in our field of vision, meaning that there are many fewer photons hitting your retina than your digital device which is placed very close to your eyes. 00:13:12 This problem extends beyond spending your nights with your digital light emitting devices in front of your eyes. The World Health Organization (WHO) recently declared night shift work as a probable carcinogen due to not only the suppression of melatonin – which is not only your sleep enducing hormone but also an anti-cancer agent. In addition, by keeping your phone beside your bed you’re further disrupting your sleep with text message alarms and vibrations. Those abrupt shots of bright light into your eyes as you wake up and check your messages signals to your brain that it is daytime, and it stops producing melatonin. 3. To what extent are depression and anxiety in adolescents due to digital media use, and which children are most susceptible to these disorders? 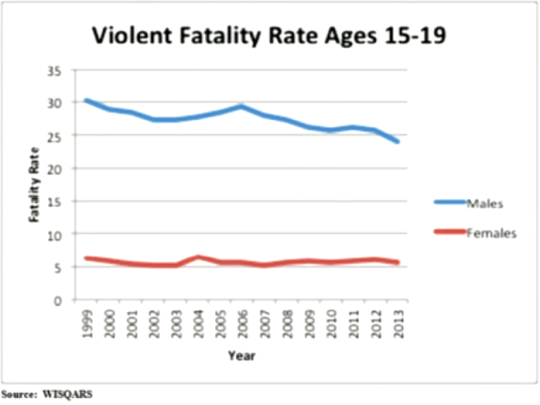 Looking at the fatality rate of teenage adolescents since 1999, in 2013 roughly 24 out of every 100,000 males died, a percentage which as slowly fallen by 6 adolescent males in 1999.
since 2008. People have been contributing this effect to the 2008 financial crisis which, by the way, raised suicide rates for all age groups – particularly for adults in their 50s and 60s. Although violent fatality rates among this age group has fallen, this rate is still well above what it was in the 1960s, and this may be due in part to the amount of violent video games children have at their disposal today. Children at this age are also having fewer pregnancies and using less drugs such as cannibis, alcohol and tobacco. 00:24:22 When kids feel hopeless they are more likely to consider suicide, and one way we tracked to see if social networking was a source of this hopelessness was by determining whether kids learned of peer suicides through social media, and if this knowledge of suicides increases their likelihood of contemplating suicide. Our studies confirmed that kids who were exposed to suicide were more likely to hear about it through their social networks. Not surprisingly, kids who spent more time online also had many more social media friends than average, but this didn’t automatically lead to an increase in suicidal thoughts among those kids. An increase in hearing about suicides doesn’t automatically equate to an increase in suicidal tendancies. To determine this you must understand what your kids are doing while on the internet and social media sites. Studies showed (in 2013) that the kid’s interest and involvement in forums – where people go for advice and help – correlated to an increase in the likelihood of suicidal tendancies. 4. On the internet, where you’re going and what you’re doing there matters most. What content are your children absorbing while they are online? Digital media isn’t the cause, but it is likely making it much worse. There also appears to be a high correlation between withdrawing from social events, depression and suicidal tendancies among children who gravitate more and more towards video games and certain forums with likeminded peers and sources on the internet. 5. What is the relationshlp between digital, teens and their need for reward and recognition? 00:30:43 First we must admit that there is a little bit that we know, and there is a little bit that we can postulate based on what we know, but then there are things that we cannot intelligently say too much about given what we don’t yet know about the subject. We know that adolescence is a time of life when kids actively seek reward, social acceptance and experience a hightened sensitivity; hence the power of peer pressure. This allows you to extrapolate this reward-seeking need to risk-taking and sensation-seeking behavior. Comparing brain scans with humans from different age groups, we can link this to the brain’s dopamine circuitry which modifies how adolescents perceive opportunities for reward. We can also extrapolate that digital media has become a very important source of rewards. Putting these known variables together we can conjecture that teens are especially prone to becoming invested in digital media technologies and even more vulnerable to the adverse effects associated with their use. 00:33:47 It’s important to keep in mind that anyone can gather facts and tell a very reasonable and persuasive story about the impacts that digital media and technology are having on humans, but it’s also important to realize that there still currently is very, very little direct data and evidence to verify the accuracy of the stories we tell. [EDITOR’S NOTE: Recall in Tyler Cowen’s TED Talk Why You Should Be Suspicious of The Stories You Hear that stories and metaphors act as an information filter allowing the storyteller to summarize key lessons and pack a lot of information and social power into a brief narrative by ignoring certain bits of information while highlighting others. Humans are biologically programmed to respond to stories. But the more inspiring a story makes you feel, the more nervous you should become because the best stories are often the trickiest ones. When information is conveyed to us in the form of a story, we often place more importance on it, remembering it when perhaps we shouldn’t. Also recall in Rory Sutherland’s talk The Next Revolution Will be Psychological Not Technological that one thing ‘the next big things’ have in common is that they come from a place you wouldn’t expect, and when people do try and predict the future they basically take the most visible form of progress they’ve seen in their own lifetime and extrapolate upon it. 6. What are the positive outcomes and advantages of online and video game usage? 00:38:51 There is a niche sector within the video gaming industry that builds games with the express objective of helping improve cognitive abilities – particularly for younger and elderly people. When seeking positive changes in human behavior, it’s important to identify the positive signal(s) – the mechanisms that actually provoke changes in human behavior that you can build upon and then transfer from the digital to the real world in the form of law and public policy changes at the governmental level. Connected video games that require communicating and interacting with others in the game can provoke the same development in the brain that is used in real-life interactions. Also, video games that require body movement don’t currently replace sports and athletic activities, but they do provide positive health outcomes for people who aren’t interested in sports or who have limited mobility. 7. What is the correlation between digital media and obesity, and how an we limit its impact? 00:46:01 Obesity has become a major public health hazard. There are many causes of obesity, and ‘screen time’ – the amount of time spent in using digital media – is one of the most documented causes among adolescence. Most people believe that obesity is caused by the lack of physical activity while using digital media, when in fact a reduction in screen time doesn’t automatically lead to more measurable physical activity. 00:49:02 We have evidence that screen time negatively affects sleep time, and we also have evidence that reduced sleep leads to changes in obesity. The major cause of obesity is calorie intake, which is the effect of advertising and marketing you get through exposure to media, coupled with eating while viewing. On average, children seem to consume about 1/3 of their calories while in front of a computer screen. Setting limitations in screen time with digital media. For example, allowing your children only 1 hour of screen time per day (7 days per week) is an easily set limitation that children can understand and obey. Not eating while using digital media and confining your eating to only certain times during the day. Using ad blocking software to limit your exposure to advertising and marketing. It’s also important to differenciate between recreational and educational screen time. But the line between recreation and education is subjective as some parents want to encourage their children to be entrepreneural and technologically-minded, therefore all screen time might be considered educational. It would be interesting to study the effects of obesity, productivity, and sleeping habits by controlling the type of advertising people are exposed to during screen time. Posted on November 17, 2015 February 17, 2017 by Joshua SMITHPosted in videosTagged digital media, harvard university, men, psychology, sackler colloquia, Stanford University, temple university, University of California, videos, youtube.